Broken Face and Keyhole are happy to announce the arrival (April 17th 2001) of the first full-length album from Madison, Wisconsin-based Michael Hopkins' solo project Tinsel. 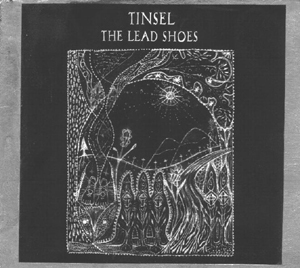 "The Lead Shoes" finds him improving and honing his fractured folk arrangements, diversifying instrumentation (i.e. less guitar, more samples), resulting in a whispering, submerged sound totally unlike your regular one man sonic experience. The songs were in large part recorded in an old abandoned stone building located in a former lead mining town, and the isolation and sadness within its walls seeps right into the music. Tinsel has formulated the musical equivalent of this dark deserted town. Old signs hang loosely from their creaky hinges. Most of the windows have been smashed out, and the wind seems to blow more harshly than normal. That this ugly reality and the withering honesty hangs in the air like distant echoes in the clear night of a hidden valley all through the record's 51 minutes of droning melancholia is nothing less than stunning. "The Lead Shoes" doesn't only sound fantastic, it's a treat for the eye too, the first 200 copies (of a limited edition of 500) comes in silver painted CD-sized gatefold "albums" with mind-altering artwork perfectly illustrating the aura of the whole thing. Or more precisely, it's a document about dreams from a fractured frame of mind, love and inner/outer exploration which brings to mind equal parts Coil, Third Eye Foundation and Jan Svankmajer. I think you know what that means. Contact matsanna@mail.bip.net or keytapes@aol.com for further information. For reviews, visit Keyhole here. The Broken Face is very happy to announce the arrival of our first CD compilation, "Urban Meadows" - 74 minutes, 17 tracks of (mostly) exclusive material from the likes of: Alchemysts, Dipsomaniacs, The Spectral Light & Moonshine Snakeoil Firefly Jamboree, Charalambides, Green Pajamas, Hood, Dunlavy, Illyah Kuryahkin, Brother JT, rhBand, Renderers, Magic Carpathians (ex-Atman), Rotten Piece, Tinsel, Continental Fruit, Tadpoles, and Ring - with gorgeous cover art from Timothy Renner (of Mourning Cloak, Stone Breath, Spectral Light...). Official release date - March 22nd 2000. I am sorry to report that this gem now is sold out at source (that's me) but you can still get it through some of the best mail-order companies in the world (Midheaven, Blue Sanct, Popopdrops et al). A compilation cassette that originally served as a sort of a bonus for our subscribers but it is also for sale separately. The cassette is mainly devoted to small bands yet to be discovered by the masses, but there also appear bands that have record deals and several releases in the luggage. The compilation covers, as we generally try to do in the 'zine, a wide range of music. Featured bands are in alphabetical order: Alnico (GBR), Dipsomaniacs (NOR), Dunlavy (USA), Magnetic Health Factory (USA), Now Voyager (NOR), Prudence (FIN), Ring (NOR), Sarkanais Oktobris (Latvia), 10th Floor Orchestra (NOR) and the Sgusting (NOR) SOLD OUT. Official release date - December 20th 1998. We're always looking for new bands/artists for the Broken Face imprint. If you think that might be you or your band don't hesitate to contact us. We hope to hear from you soon.